COLUMBIA, Mo 1/12/18 (Feature) -- A war of words armed with personal insults has erupted between a Boone County Commissioner and critics of a plan they say would "steal" a Columbia sports center by relocating it to the Boone County Fairgrounds. Columbia voters approved a 2015 parks sales tax in part on a promise city officials would build the new $3 million sports center -- which includes basketball courts and soccer fields -- at Phillips Park south of town. But Southern District Commissioner Fred Parry insists the sports center belongs at the Fairgrounds, a beleaguered event venue shuttered since 2015. He tackled critics of the plan a few days ago in a rambling post on his political Facebook page. "There are a lot rumors and misinformation floating around about the future of the Boone County Fairgrounds," Parry wrote, adding seven "facts" about the Fairground's condition, the sports center plan, and its critics. 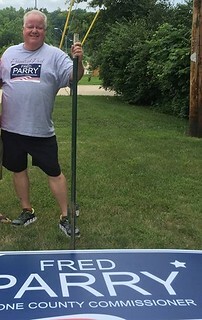 "I want to strongly encourage everyone to ignore the mud-slinging antics of perennial County Commission candidate Jimmy Pounds and a few folks from Sturgeon who want to keep the fair there," Parry wrote. "They DO NOT know what they are talking about and they have ulterior motives." Since the Fairgrounds (yellow outline in photo) closed, the town of Sturgeon has hosted Boone County's annual fair. 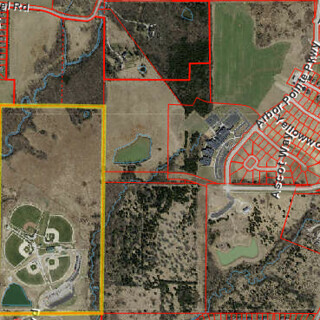 Referencing 276 acres of prime development land next door to the Fairgrounds (red outlines in photo) that would get a huge boost if the sports center relocated, developers would "make a fortune" while taxpayers would be "stuck with the bill" business owner Paul Prevo, a member of several area boards and commissions, told Parry. "That’s pretty unfair," Parry shot back. "You can’t gripe about not having a solution and then take below-the-belt punches." "Someone else stands to get a little more coin in their pocket," Prevo added. "This is not about saving the Fairgrounds. This is about partnering with the city and enslaving taxpayers." "C’mon Paul. Be fair -- and thankful that no one is holding up a magnifying glass on your tenure as Chair of the Youth Empowerment Zone," Parry responded, referencing recent problems at the Columbia-based youth program Prevo's board oversees. The word war started a few days earlier, after lobbyist Jack Cardetti lobbed some grenades of his own. Cardetti accused Parry of violating voter trust to enrich the same developers Prevo referenced. Cardetti (left, below) represents developer Bruce Odle, who is building an office and residential complex next to the proposed Phillips Park sports center. "What you have is Fred Parry and some developers and private interests sitting in a back room and trying to decide how they can get this built," Cardetti told KMIZ News Jan. 5. "They're treating the citizens of Columbia like an ATM. They're going to try to raise the Boone County sales tax, and it's really disrespectful to voters." Parry, however, views the Fairgrounds as vastly superior to Phillips Park. It offers more space, and would accomodate three to four times as many events and attractions, e.g. four basketball courts at the Phillips Park location vs. thirteen at the Fairgrounds. He admits to Cardetti's non-transparency charges, but says negotiating real estate issues "behind closed doors is the only way to protect everyone’s interests." Parry's plan to save the Fairgrounds is a mishmash of sports and ag. He says he has spoken to the Boone County Fair Board, 4-H Livestock group, and Future Farmers of America "to take care of the kids in Boone County interested in agriculture." But helping them "is only financially viable if we are able to build soccer fields and a basketball arena on the Fairgrounds property," Parry explained. Others question the idea of county-based ag experts making decisions for Columbia kids interested in sports. "I am not at all happy that Fred worked solo to put this sports exclusive deal together, with only 4H and Boone County Fair Board input," Margaret Booker wrote on his Facebook post. "It was a shock to read in the Tribune that a deal was in the works with City Parks and Recreation, who absolutely declined to partner with the County on a sports component." "Margaret....with all the RESPECT that I can possibly muster in response to your rumor-mongering, fictitious post above....YOU DON’T HAVE ANY IDEA WHAT YOU’RE TALKING ABOUT," Parry responded. "Get the facts and then spread your fear." Ironically, Parry may be the only person in mid-Missouri so committed to fixing the Fairgrounds. He sees the sports center as a panacea for the Fairgrounds long decline. Buildings on the site are “rotting from the inside out," Parry explained. "They simply need to be torn down." As he celebrates the first year of his County Commission tenure, Parry speaks almost as a man possessed, with the righteous vision of a triumph over adversity he can uniquely call his own. "I have a minimum of two meetings each week about the fairgrounds," he said on Facebook. "The walls of my office are covered with fairgrounds maps and previous master plan proposals. I believe we have made significant progress towards solving a problem that has now existed for 19 years." You are here: Home Boone County FAIRGROUNDS FRACAS: County Commissioner blasts critics of Columbia sports center "theft"